A fine selection of Mixed Gerbera in a bouquet subtly paired with greenery. 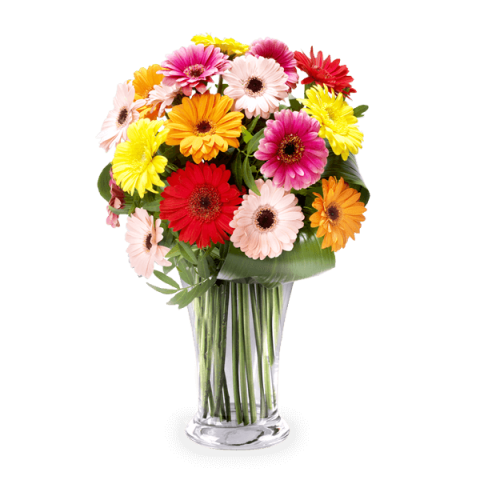 Use FloraQueen today to get quality gerbera flowers delivered to over 100 countries. While we can’t promise your local river will run green this March 17th, we can promise a great range of wonderful bouquets to celebrate this most Irish of days. As you’d expect, green features strongly in the arrangements. With our international flower delivery service, it’s so easy to set up. A couple of clicks and it’s done. And, why not top off the day with a pint of plain? It is St. Patrick’s Day after all! And if you send flowers for St. Patrick’s Day, why not do the same on other important festivities? FloraQueen’s international Valentine’s Day flower delivery is the perfect way to say “I love you” to your special someone.